Does the Law Decide What Rights Are Afforded to Uber Drivers—or Does Uber? The company is offering union-like organization to its employees, which will keep them from accessing the full benefits of an actual union. Uber drivers demanded the right to organize, and the on-demand economy delivered—at least, that’s what happened according to Uber. Rather than a union, the ride-sharing mega-corporation has been creating representative “associations” for drivers, supposedly to give them a democratic collective voice. But drivers are at the same time fighting in court for the right to hold the company accountable before the law. The driver’s association framework emerged in April, out of a proposed legal settlement of a massive lawsuit in involving drivers in California and Massachusetts that could curb future legal challenges to Uber’s business model. If approved, the $100 million settlement would largely preserve a highly controversial arbitration clause that could keep future labor disputes out of court. The proposed settlement, however, hangs in limbo following the recent decisions by two federal judges to defer rulings in suits brought by drivers of Uber and rival app Lyft. According to Uber’s press release, the drivers’ associations would provide a collective platform for drivers to voice their concerns directly to management four times a year. Uber emphasizes that the associations would definitely not provide formal collective-bargaining rights, so, unlike a union, drivers would have no direct say in negotiating working conditions under federal labor laws. (In fact, that would be illegal, since the National Labor Relations Act prohibits companies from controlling labor organizations as so-called “company unions,” as The Huffington Post reports.) Uber continues to insist that its drivers are not employees as defined by the NLRA, but rather independent contractors, though drivers have brought numerous legal challenges over their classification as non-employees. Uber’s drivers’ association framework arrives just in time to provide some semblance of intra-company democracy as it rolls out a new policy on driver “deactivativations,” which are essentially the equivalent of firing drivers. “Deactivation” has become one of the most contentious issues for drivers who have found themselves suddenly out of work because of an opaque, seemingly arbitrary decision by their non-boss. Uber says it has, as part of the settlement, “agreed to create an appeals process in California and Massachusetts for drivers who disagree with these decisions,” to allow “peer review” in an Uber-controlled tribunal of sorts. Separately, for some disputes, drivers might still be subject to arbitration processes, potentially blocking further litigation on labor conditions or employment status. Alongside the proposed California and Massachusetts drivers’ associations, Uber has announced plans for a similar representational system for its Seattle drivers. Not coincidentally, Seattle is also one of the first cities to pass legislation that would allow a form of collective bargaining for drivers at for-hire vehicle services. Stone describes Uber’s arbitration clause as part of a strategy to “avoid the entire issue of whether its workers are covered by the laws in the first place…not only do workers lose their employment rights—we as a society potentially lose our entire framework of employment protection that we spent a century constructing.” Many drivers, whose jobs hover somewhere between a sole proprietorship and digital-age serfdom, could lose access to formal judicial review to resolve issues of, for example, wages, scheduling conditions or job benefits. Instead, drivers’ grievances would be channeled into an extrajudicial arbitration process under Uber-approved rules. But Uber drivers’ rights and legal status in different states remain an open question, especially as drivers’ due-process rights are limited by their contracts. Their relationship to the company as part of Uber’s workforce is also far from settled. 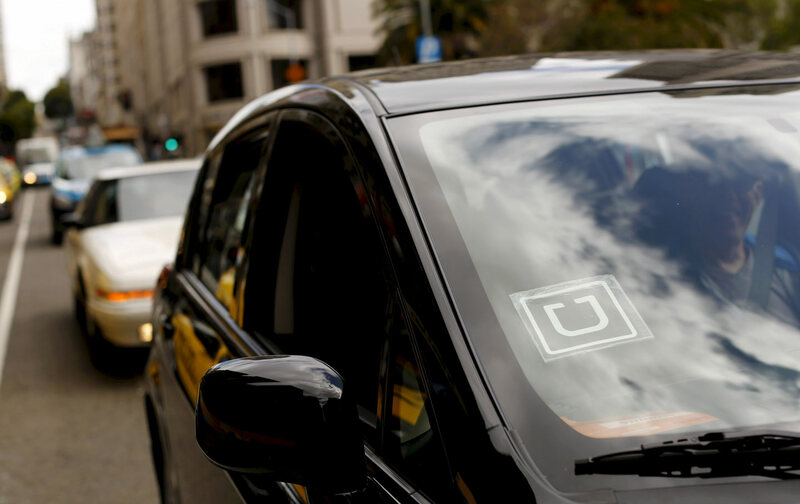 Last year, the California Labor Commissioner did deem an Uber driver a bona fide employee under California labor laws, but Uber claimed the ruling was limited and not applicable to all drivers. Meanwhile, Uber’s next big turf war may be heading to New York City’s streets. Uber recently struck a deal with the Machinists union to establish a semi-representative drivers’ “guild,” specifically for an estimated 35,000 New York drivers. The initiative seems yet another preemptive strike against both city officials seeking to control Uber’s anti-regulatory expansion and traditional cabbies campaigning for full-fledged labor rights for all for-hire drivers. The guild is a company union intended to bring political cover to Uber’s anti-worker, destructive business model. It serves itself and gets money from the boss. It’s only relevance is that for a company with one-third more lobbyists than Walmart, this is one more. Uber can disrupt the market as it famously desires, but not our movement. Uber drivers now face many precarious legal pathways to determine their destiny as workers—including questions on the prospects of forming real unions and access to due process. So state by state, drivers keep edging toward a final verdict on whether the courts, or an app, will control their rights at work or under the constitution.